Now that Donald Trump has been elected, one of my main goals will be to convince him and his team that it would be wrong to leave government spending on autopilot (and it would be even worse to spend more money and increase the burden of government!). Since Trump semi-endorsed the Penny Plan, I don’t think this is a hopeless quest. But it will be an uphill battle since populists have a “public choice” incentive to appease interest groups. But we have a very powerful weapon in this battle. It’s called evidence. And now there’s even more data on our side. The Institute for Economic Affairs in London has just published an excellent new book on fiscal policy. Edited by Philip Booth, Taxation, Government Spending, & Economic Growth is must reading for those who want to understand the deleterious impact of the modern welfare state. The IEA’s Director General, Mark Littlewood, explains the goal in the book’s foreword. The authors of this monograph have taken a rigorous and data-driven approach to discovering and documenting the size of the state and how government spending and regulation affect the wider economy. But, most importantly, they have undertaken a major and original statistical analysis of the economic costs of high taxes and, equally importantly, which taxes cause the most economic harm. The most depressing part of the book is contained in Chapter 3. As you can see from Table 7, the burden of government used to be rather modest in western nations. Indeed, I’ve made the point that it was during the era of small government that the western world became rich. But now look at the numbers. Pay special attention to the period between 1960 and 1980, which is when the welfare state exploded in many of the countries (aided and abetted by the value-added tax). But let’s not cry about unfortunate historical developments. It will be more productive if we measure the harm so we can educate policy makers about the need for spending restraint. And the book is filled with lots of useful information in that quest. In Chapter 4, David Smith explains the interaction between fiscal policy and economic performance, noting that excessive government not only reduces the level of economic output, but also the future growth rate. …increased governmental consumption appears to reduce national output. This is likely to be because the resources diverted to supply such expenditures would be better employed in the private sector. In particular, the evidence from international cross-section and panel-data studies suggests that almost all increases in the share of governmental expenditure in GDP lead to a near one-for-one reduction in the share allocated to private capital formation. This under-capitalisation takes the economy onto a lower, but parallel, growth path according to ‘neo-classical’ growth models but leads to an additional permanent reduction in the growth rate in the context of a ‘post-neo-classical endogenous-growth’ model. He provides a micro-economic explanation for why various government activities hinder growth (I offer eight reasons in this video, by the way). Transfer payments are likely to reduce economic growth in various ways, not least because of the supply-side effects of the taxes necessary to finance them. Unlike with government investment, there is unlikely to be any offsetting effect on growth. These have grown rapidly over the last century. Transfers in the form of pensions and other payments to people at older ages are likely to reduce saving in the private sector and fixed capital formation. However, the most potentially counter-productive public expenditure appears to be paying means-tested welfare benefits to the population of working age. These reduce potential GDP because of their impact in reducing the supply of labour to the private sector, which exacerbates the effect of the taxes necessary to finance them. …there has been a big increase in government spending over the last 100 years. However, within the government spending envelope, there has been a particularly large increase in those items that damage the economy most while those items that tend to have a beneficial effect on growth or which damage the economy least have been reduced. In other words, he’s saying that not only is government too big. He’s also pointing out that much of the spending is seemingly designed to impose economic damage by discouraging the productive use and allocation of labor and capital. I also like that he explains that the real problem is spending, not just red ink (a point I often make, but not always successfully, when talking to politicians). …statistical evidence that suggests that the negative effects of higher taxes and budget deficits on private activity are identical in the long run and quite similar in the short term. This confirms that the primary issue is the size of state spending compared with national output and that the choice between tax and bond finance is a secondary consideration. Ultimately, government spending is financed either by taxes levied now or deferred taxes. …it is reasonable to ask whether there are ‘growth-maximising’ or ‘welfare-maximising’ levels of government expenditure. …The growth-maximising share of government spending in GDP was some 20–25 per cent of GDP. This was based on the fact that ratios in this range were typical of the fast growing South East Asian ‘Tiger’ economies, countries such as Japan and Korea in their high growth phases, and even Australia, Canada and Spain in the 1950s. This indicative range should probably be revised down to some 18.5–23.5 per cent, using current (June 2016) UK definitions. Incidentally, I like and dislike what he wrote in this section. I like it because the obvious conclusion is that the burden of government is excessive in both the United States (37.9 percent of GDP according to OECD fiscal data) and the United Kingdom (43.3 percent of GDP). And we can use this data to argue for much-needed spending restraint. But I don’t like the above passage because I think the growth-maximizing size of government is well below 20 percent of GDP. As I’ve previously explained, academic researchers are constrained by the lack of data for small-government economies. So when they crunch numbers (relying in all cases on post-WWII data, and in most cases on much more recent figures), they basically find that Hong Kong and Singapore grow the fastest and they think that implies the public sector should consume 20 percent of economic output. But that implies, if you recall the data in Table 7 from above, that nations would have enjoyed more growth in 1870 if they doubled the burden of government spending. I think that’s nonsensical. 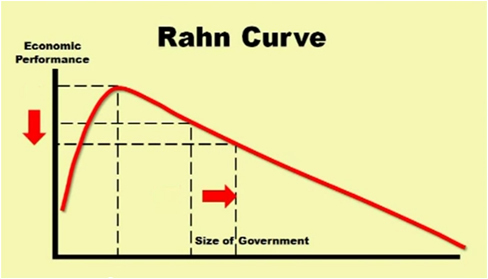 What’s really happening is that researchers are simply measuring the downward-sloping portion of the Rahn Curve. But just because Hong Kong and Singapore are the first two jurisdictions that can be plotted, that doesn’t mean the Rahn Curve peaks at that point. But I realize I’m nit-picking, so let’s go back to the book. In the following chapter, Professor Patrick Miniford shares some additional research on the link between government spending and economic performance. 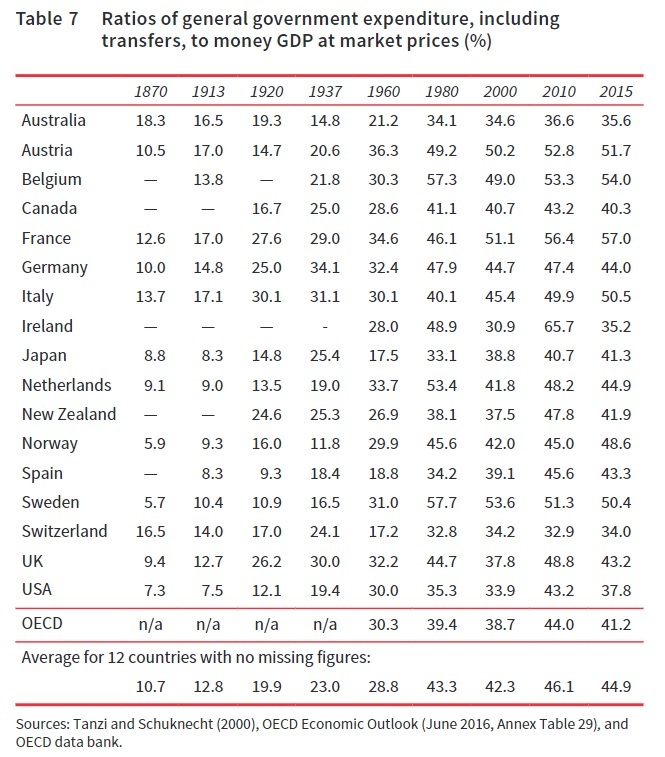 I especially like how he shares a very useful table looking at some scholarly findings on the relationship between the overall fiscal burden and national prosperity. He also shares the conclusions from additional research. Later studies show similar associations. 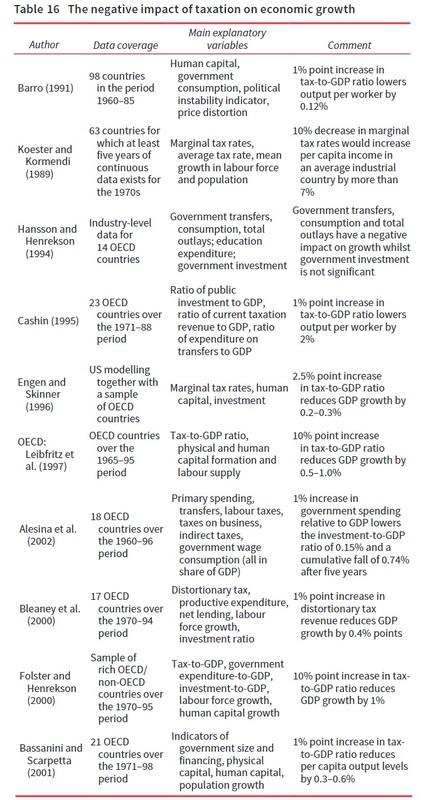 For example, Afonso and Furceri (2008) examine a number of EU and other OECD countries over the period 1970–2004. As well as several components of government expenditure and taxation, they include variables such as initial output, population growth, investment ratio, human capital and openness. Their finding is that a 1 percentage point rise in the government spending to GDP ratio cuts growth in the OECD by 0.12 per cent and in the EU by 0.13 per cent. …overall, the tax (or government spending) and growth studies, indicate a strong association between the two variables. As a rule of thumb, it would appear that a 10 percentage point fall in the share of national income taken in tax would lead to slightly more than a 1 percentage point increase in the growth rate – results of this order of magnitude occur over and over again. And he discusses some new statistical findings, along with the potential implications for the United Kingdom. …the relationship between the growth rate of GDP per capita, the tax rate, a dummy variable specific to each time period, and a dummy variable specific to each country is modelled. Panel data were used that were averaged over consecutive decades from 1970 to 2000 for 100 countries. …overall, the modelling found an overwhelmingly strong negative relationship between tax and growth…there is an elasticity of growth to tax of approximately –1.4 at the mean of the growth rate (1.6 per cent). …a fall in the tax rate by 25 per cent of its existing value (from about 40 per cent to about 30 per cent of national income in the UK) would lead to a rise in the growth rate to 2.7 per cent if the initial growth rate were 2 per cent. This is roughly in line with the growth regression results discussed above. I’m sure the data and conclusions also apply to the United States. Which brings me back to where I started. I fretted yesterday that Trump’s election will be a challenge to advocates of economic liberty. Indeed, he explicitly called for more infrastructure spending and implicitly called for more VA spending in his acceptance speech. Combined with his apparent rejection of entitlement reform, this doesn’t instill much confidence. But that’s all the more reason to disseminate this new research on the bad consequences of letting America become more like France.